Over the past couple of years, we've seen a lot of companies work really, really hard to make VR as immersive as it can possibly be. Touch controllers to mimic your hands, trackers to bring real objects into VR, haptic feedback that make virtual sensations real. There's a different class of VR that's also been building itself up, one that takes place in dedicated spaces outside of your home. For the most part, this area has been dominated by The Void, which refers to this as hyper reality and is partnering with Disney to make a fully immersive Star Wars VR experience. But now there's a new kid on the block called Nomadic, which announced itself back at CinemaCon in March. It's hands-down the best VR experience I've ever had. Nothing else has come even close. Kalon Gutierrez, Nomadic's head of growth, didn't really give me any instructions or prime me on what to expect as I put on the rig, which comprises an Oculus Rift and a PC backpack. He only told me that Nomadic had built a modular system, designed to be updated, adjusted and changed quickly. When it's all fully ready, and a bunch of different experiences are built, customers will be able to choose what they want to do. "The idea is that concepts can be changed out from half an hour to two hours so that venues don't have a significant amount of down time," said Gutierrez. As for the Oculus and PC backpack? Nomadic isn't out to create its own VR headset here, as The Void has done. It wants to be platform agnostic, so that it can quickly upgrade to the best tech, bouncing between HTC Vive and Rift, different PC backpack manufacturers, or sensor makers. Whatever provides the best experience, Nomadic wants it. The headset was on, the speakers were down and a lady with a British accent started giving me instructions. The display lit up with an exact model of the Nomadic experience room in front of me, and I walked over to its door. It went from pristine white to brown and aged, like an old, abandoned maintenance shack in the wrong part of a city. The lady told me to look for a flashlight – it was dark, after all, and I needed to light the way. So I turned my head slightly to the right and saw it, but was it really there? No one had handed me a touch controller of any sort, so I reached out and grabbed it – and lo and behold, it was an actual flashlight. I pointed at the door and reached for the handle. I swung the door open and entered, closing it behind me. The light lit the way, as I moved through a room of security monitors and down a hallway, with a furnace on the left. Nice touch, I thought, some added atmosphere to make the place feel extra murder-y. However, as I passed by the furnace, it got really, really warm. The furnace seemed to actually be there, and it was surrounded by pipe fencing that made sure I couldn't get too close to it. On the right was a file cabinet with some pizza on it, flies circling it in a celebratory fashion. At this point I had to ask… was I going to reach out and feel a real slice of Sicilian? I put my hand down, but nah – just glass. Immersion broken, until a voice called from outside the window and the security monitors sprung to life. Some guy was talking about some other guy and something bad was happening and only I could stop it and save the city. I wasn't really paying attention, I was too busy admiring the cool breeze coming in from the window. Soon, I was told to put my flashlight down and check a filing cabinet for a gun. The one-to-one tracking here was amazing, and armed with my new weapon I headed outside and greeted by an obstacle: a plank. I stepped on the plank and immediately felt like I was actually five stories up. The plank bent as if it was actually bridging two tall objects and threatening to snap under my weight. As I moved along, my balance shifted and I thought I could fall to my death, though I soon decided there was no way the Nomadic team would let me die… would they? The last notable moment came as I stepped into a construction elevator, which felt as rickety as it looked. But how? Soon I was done, the headset was off, but I had a lot of questions. Firstly, how did it all feel so real? Gutierrez took me into the door I came out of, as a grimy downtown area turned back into a brightly-coloured room built with LEGO-like structures. Up above, there were a bunch of cameras and sensors. On the right, I saw the elevator, but it didn't actually move up and down. Nomadic's head of physical design, John Duncan, who worked at Lucasfilm's special effects arm, came up with this one. As he explained, little motors underneath the elevator give it the impression that it's moving, and it's designed to make you feel every jolt and every jerk, while fans blow down to give the feel you're moving upward. "[Duncan is] the one who's thinking of 'hey we need to create an elevator that feels like you're riding up and it's a little bit shaky and bumpy and gives you the sense you're not in the most stable environment,'" Gutierrez said. Duncan was also the one who thought up the grooves on the EMP lever, making it feel old and rusted when it was instead shiny and new. The plank I feared so much? It was just on the ground by itself. Duncan had added in small risers that made it feel like it could bend and sway under human weight. There were also LED lights on it speaking to sensors up in the roof that registered every movement. So when the plank bends, its virtual counterpart bends too. Even better, if the system sensed you were nervous about the plank by standing there too long, it would widen the platform to make it feel easier to walk on. Each secret was slowly revealed to me. There were fans bolted up on the wall mimicking wind coming into the room and a heater playing the part of the furnace. The gun and flashlight were specially made props with LED sensors on them that, like everything else in the room, communicated with the roof's cameras. Nomadic's special sauce is what it calls its Wow Teams. 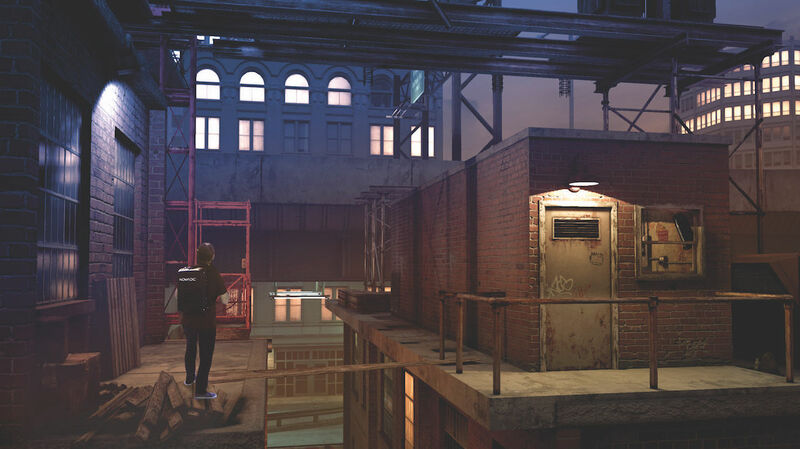 The Wow Teams create physical manifestations of items from inside the virtual experience, like the flashlight or elevator. The teams aren't limited to props either, they also figure out how to best translate an idea, like placing a heater where the furnace is so that you feel the heat. Nomadic is working with partners right now, but it won't say who. Gutierrez does assure me that it wants to work with a wide spectrum, from individual creators and VR studios to major Hollywood studios like Warner Bros and Fox. It's looking to debut its first third-party experiences by the end of 2018. That would come after it launches its own experience in the beginning of 2018, which would be similar to the warehouse-based game I played. One caveat: Nomadic hasn't nailed down a location yet, though it's got a couple of options to choose from. So where would you find Nomadic VR experiences? The one I tried was a 20 ft x 30 ft experience, but the full size will be more around 40 ft x 60 ft. However Nomadic can adapt to the size of the location if it's smaller. As for venues, Gutierrez says Nomadic wants locations with lots of reach and density. "If we're not working in Cincinnati, Ohio, we're not gonna provide a scalable model. That's what's important to us. We see this as a new medium of entertainment, just as films were back in the day or computers. It needs to be accessible." That means malls. That means movie theatres. That means places where there are lots of dining and shopping experiences. And most importantly, it means charging around $10 to $15 per person. That's about as affordable as a movie ticket, and is enough to be a spur of the moment thing for a group of friends. That spur of the moment could ideally come before or after going to see a movie. "We might be the attraction that draws people in. First they say they wanna do the virtual reality experience and then they say cool, now I want to see the movie or back and forth." For example, imagine going to see a new Batman movie and then immediately jumping into a high quality VR experience where you can actually help – or be – Batman, or vice versa. It's the same idea that IMAX is exploring with its VR centres. The potential for Nomadic's own modular, adjustable VR centres is there. It's working on multiplayer experiences that are both collaborative and competitive; escape the room type experiences; kid-friendly experiences and even edutainment experiences. The one area Nomadic might not step into is horror mazes with scare actors. "It's not something on our radar to do," Gutierrez said. "We want to make the virtual world come alive. It's not in our interest to have real people engaging with people in the booth. I would say – if anything – [engaging] would be for safety." One of the problems with doing experiences in physical space is foot traffic and capacity. Nomadic's current VR experience does one person at a time and is only about five minutes long, which means it can do about 30 people an hour. But some people will inevitably take more time than others. To deal with this problem, doors between different rooms will stay locked until the person in the next room is done. More clever is how the team are thinking about transition scenes; if you're in the elevator and the person ahead of you is taking a long time, the lift will just take a longer time to "reach" its destination. Nomadic can adjust all of these things in real-time to control the flow. The experience itself goads you to move along, like encouraging you to walk across the plank or leave a room. But the other potential crowd flow problem Nomadic might run into is related to its location. If it slots into already-existed areas, as it plans, adjacent to cinemas and restaurants and what have you, how do you handle ticketing? This is something IMAX's VR experience centers are trying to figure out. Will people line up, or will they make appointments for certain times? How do you keep a well-oiled loop during normal business hours that doesn't frustrate customers? This is an age-old problem that even theme parks still struggle with, and Nomadic will have to answer that as they start opening up locations. The bread and butter of Nomadic's VR experience is how immersive it is. The props and tricks it uses to make you feel like the virtual world is real are impressive, and they kept a huge, goofy smile on my face. Even better, I didn't feel sick afterward. I wasn't nauseous. The accuracy of the one-to-one tracking gives you incredible confidence in everything you're doing. There wasn't a moment where I didn't feel like everything in the world was real. Well, except when I touched glass instead of pizza. Gutierrez tells me they're working on that though, with plans to add smells so that you can actually smell the pizza. It's not a mid-experience snack yet, but hey, baby steps.